Image caption Victim Glyn Rouse made music that "brightened and improved a lot of people's lives"
A man who stabbed a stranger to death near a playground has been detained indefinitely at a secure hospital. Musician Glyn Rouse, 61, was "minding his own business" in Cherry Lane, Crawley, when he was attacked by Vladimir Ivanov on 28 November 2017. Ivanov, 23, of Juniper Road, Crawley, denied murder but pleaded guilty to manslaughter by diminished responsibility at Lewes Crown Court. He was given a hospital order under the Mental Health Act. The Bulgarian warehouse worker was also given a life sentence with a minimum of four years imprisonment. He will be detained in a secure psychiatric unit until cleared for release by the parole board and Justice Secretary. Mr Rouse's family paid tribute to the "extremely talented man who loved the arts". 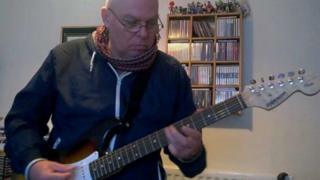 They said: "He was extremely dedicated to his music and excelled at guitar playing. "His music brightened and improved a lot of people's lives, and all of his family and friends will remember Glyn when they hear a guitar being played well." Mr Rouse was attacked by Ivanov on a footpath close to the playground at about 10:30 GMT and discovered by passers-by with serious wounds to his neck, head, chest and left arm, Sussex Police said. His killer was found in the area shortly afterwards. During police interview, Ivanov told officers he had taken a kitchen knife from his home and put it in his jacket pocket when he went jogging. Det Ch Insp Mike Ashcroft said: "Mr Rouse had been out walking and minding his own business that morning when he was subjected to an unbelievable, highly unusual, unprovoked attack." He said the motive for the killing remains unknown, adding: "It appears to be borne from the mental state of Ivanov at that time."